yummy...god knows when I am going to try this..but want to soon.. I too use the same ratio and method but for one change. I don't warm the cashews before powdering. Will try it the next time. The pieces have come out perfectly. 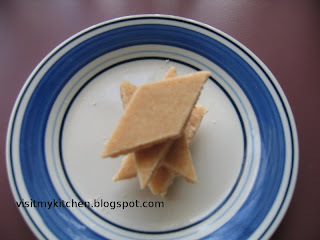 yummy burfi and so simple too! Sowmya, it is purely yumm!!! Hi Sowmya, Back again to say you have an award waiting in my blog. Glad I landed in your blog. First time here. Liked your kaju katli. Do sneak a peek in my blog sometime. As you rightly pointed out, simple & yummy sweet. 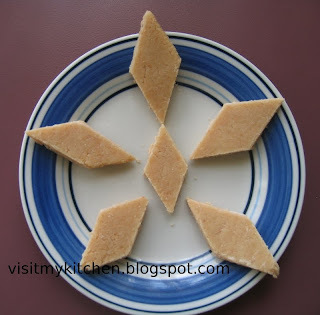 First time to your post and being welcomed by Kaju katli was a delight. Perfect recipe with a too perfect click. You have a nice space with good recipes. Am following you.